Sto Te Nema Memorial Monument, originally uploaded by bill kralovec. On my first evening in Burlington, Vermont, I decided go for a walk on Church Street. This is the “walking street” of the city and has many shops, restaurants, etc. and besides the waterfront, it is the most popular tourist area. While ambling down the street, I swore I heard people speaking Serbian. It turned out to be a group of Bosnians and University of Vermont students and employees who were putting together the monument you see above. The coffee cups are filled with Bosnian coffee and are placed on the ground. 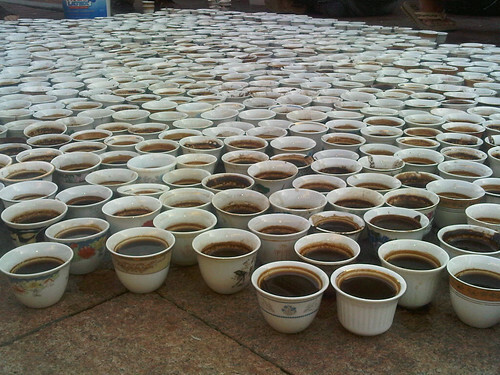 Each cup represents one of the victims of the Srebenica, Bosnia, massacre which took place on July 11, 1994. The cups are collected by Bosnian women organizations as well as the artist herself who originally conceived the project. I arrived while they were just starting to pick up. They didn’t notice my Red Star t-shirt in Cyrillic script. Monday marked the 17th anniversary of the sad event. I snapped a few photos and continued my walk. The massacre has been in the news a lot recently with the arrest of General Mladic. An excellent and objective Norwegian film shot with Muslims and Serbs in Bosnia about real happenings in Srebrenica, It is probably something nearest to the truth about Srebrenica.